The best and most accessible wildlife refuge for finding birds in California’s Central Valley. Go for the tens of thousands of Snow and Ross’s Geese and Sandhill Cranes, as well as shorebirds, raptors, owls, shrikes, bluebirds, and more. Sixty years ago, Merced National Wildlife Refuge was established to attract waterfowl away from nearby farms, where their foraging was damaging crops. Today, the refuge is one of the premier birding areas in the Central Valley. Up to 60,000 Snow and Ross’s Geese and 20,000 Lesser Sandhill Cranes winter at or near the refuge; watching them take flight on a clear January morning is a sight to behold. Shorebirds also abound in winter, along with White-faced Ibis and Great, Snowy, and occasionally Cattle Egrets. Rarities have included Blue-winged Teal and Eastern Phoebe. Nearby Sandy Mush Rd. is known for raptors; more than 15 species of eagle, hawk, falcon, and owl have been seen in the open fields and groves of oak and willow along the road. The federal government and the state of California have established a chain of wildlife refuges from Redding to Bakersfield for the millions of birds that winter in the Central Valley every year. 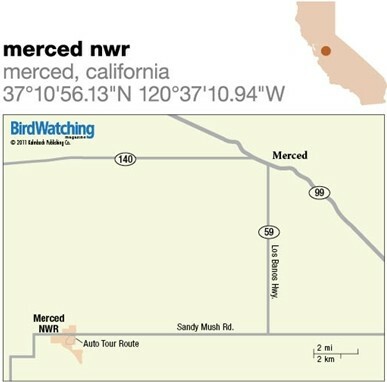 Merced is by far the best and most accessible; it’s a jewel that attracts birders from all over the West and adds to the joy of living in the valley. Merced National Wildlife Refuge encompasses 10,262 acres of wetlands, grasslands, and riparian areas in California’s Central Valley. From Merced, take Hwy. 59 (Los Banos Hwy.) south for seven miles to Sandy Mush Rd. Turn right and drive about eight miles to the refuge entrance on the left. The entrance road leads to a 4.75-mile-long auto-tour route. Wetlands, native grasslands, vernal pools, and riparian areas. More than 200 species. Snow, Ross’s, Greater White-fronted, and Canada Geese, Northern Shoveler, American Wigeon, Northern Pintail, Gadwall, Cinnamon, Green-winged, and occasional Blue-winged Teal, American White Pelican, American Bittern, Great and Snowy Egrets, Great Blue and Green Herons, Black-crowned Night-Heron, White-faced Ibis, Sandhill Crane, Bald Eagle, Northern Harrier, Ferruginous, Rough-legged, Red-tailed, and Red-shouldered Hawks, Prairie Falcon, Merlin, White-tailed Kite, Virginia Rail, Sora, Black-bellied Plover, Black-necked Stilt, American Avocet, Long-billed Dowitcher, Dunlin, Least Sandpiper, Long-billed Curlew, Great Horned, Burrowing, and Short- and Long-eared Owls, Ring-necked Pheasant, Yellow-billed Magpie, Western Bluebird, California Thrasher, Loggerhead Shrike, Yellow-rumped Warbler, Common Yellowthroat, Brewer’s and Tricolored Blackbirds, Lesser Goldfinch. Year-round. Best from November through March. Two observation platforms. Three trails branch off from auto-tour route. Photo blind. Pit-toilet restrooms. Motels and restaurants in Merced, about 15 miles away. Fresno Audubon field trip to Merced NWR January 11, 2012. National wildlife refuge. Free. Open daily half an hour before sunrise to half an hour after sunset. In winter, come early in the morning to watch huge flocks of geese and cranes fly overhead. Bring a spotting scope, water, and snacks. West of Merced NWR on Hwy. 165. More than 26,000 acres. Major wintering area for waterfowl. Look for Yellow-billed Magpie and Loggerhead Shrike in upland areas. About 30 miles southwest of Merced NWR. A large body of deep water that is good for Greater Scaup, Common Loon, and gulls.